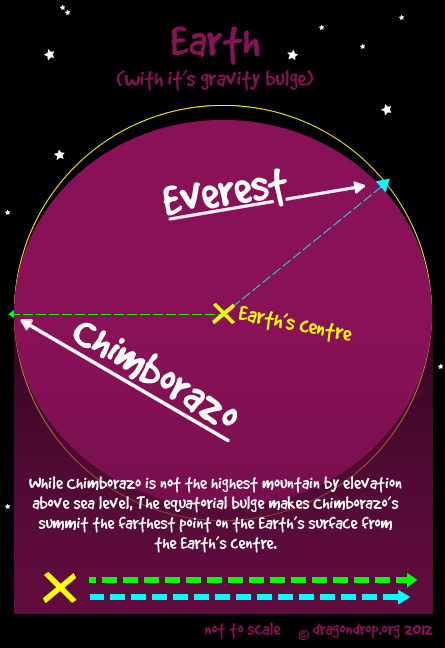 While Chimborazo is not the highest mountain by elevation above sea level, The equatorial bulge makes Chimborazo’s summit the farthest point on the Earth’s surface from the Earth’s centre. 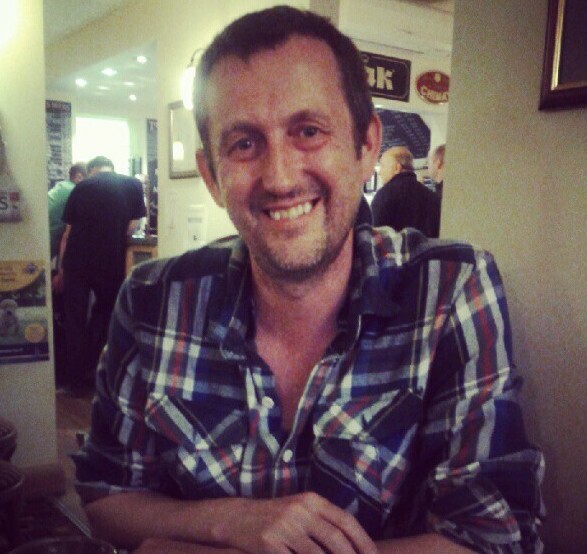 I spent the other evening in a very enjoyable fashion, at a real ale pub in Harrogate (The Swan on The Stray, for the record) in the company of a Richard Fountain, who’s about to embark on an epic adventure. Richard’s one of those blokes who makes it hard to describe what he is. He’s a charity worker. An adventurer. An altruist. He’s an overseas correspondent, a cricket fan, a Nidderdaler, a founder and CEO of The Big Table (more on that later) and an all round nice bloke. His planned adventure, is to go as far as one can go, without flying. His destination, the top of a volcano called Chimborazo, in Ecuador. The 6267m summit of which is the point on the earth’s surface that’s the furthest away from the centre of the earth. He’s setting off from Gods own County Yorkshire (an office in Knaresborough, to be specific) on a surface only journey to a point that’s the closest one can get to ‘the heavens’. We typically think of Mount Everest as being ‘the highest point’ or ‘on top of the world’ but when you think about it, it’s not. Geometrically speaking at least. I’ve tried to illustrate this in the picture above. If one wanted to be as close as one could be to the sun and the stars, yet still have one’s feet firmly planted on terra firma, you’d be stood on Chimborazo in Ecuador. When he stands on the summit, there’ll be more planet earth directly under his feet than anyone else’s feet in the world at that time. His objects are plural. Primarily, he’s collecting funds to put directly into the Henshaw Society’s good work pot via his JustGiving Page . The sub plot is to draw awareness and cement some networking links to the work of his new project The Big Table, and do a swashbuckle of good deeding and voluntary work, along the way. The journey is (partially) the destination. He’s bolstering the ‘without flying’ romance by getting there using surface only transport. Easier said than done. The short version is; on the 9th of September, he’ll embarking from Tillbury Docks, East London on a freighter bound for Sierra Leone, armed with a bunch of computer equipment for a school in Freetown, that he’ll personally deliver. From there he’s hitching a lift on another freighter, bound for Rio, Brazil, where he’ll be meeting up with a HIV charity, doing some talks and giving some classes. From there, it’s overland to Equador and up, up and away. To infinity and b.. well not quite, but close. As mentioned earlier, part of this globe hopping charity hobnobbing is structured around a fairly new venture called The Big Table. In a nutshell – It’s a bit like a social network of human rights, aid, development and voluntary sector workers, Charities, NGOs, Non Profit, Voluntary Organisations mixing it up with journalists, PRs, corporates, experts, professionals, creatives and other individuals with the aim of maximising the efficiency of everyone’s efforts by co-operation, colaboration and communication. (Phew). It’s kind of like a resource pool of everyone who’d be likely help out on Mother Earths ‘get well soon’ party. An example of this kind of thing in action is the work of another great organisation (that surprise surprise, Richard is working with..) called Stuff Your Rucksack. They ask “When travelling, take some stuff with you that will help a local charity. We’ll put you in touch with those who need it most.” The idea is that on one hand, there’s a network of knowledge and contacts, on the other, a list of dates and destinations of people travelling, being brought together to help a third party. Often, business or ‘corporates‘ want to help the world – it’s good PR (darling). But, it’s often a bit of a struggle for them to do it right. They could just present a big cheque at the front door, with a ‘mention us in your newsletter, quick snap for the local rag’, or, they could get involved and put their name behind a project or a development – even lend a hand and provide from their own resource pools in other ways. I’d have thought an organisation like The Big Table would be really well suited to help get things like that, get their balls rolling. As a foot note, as I type these words, in the admin view of my blogging software (wordpress), there’s a section on the right of the screen called ‘Categories’. I’ve set a few of these up to try group my musing into some kind of order. Often, I find it tricky to decide which category a particular article should be in. With this post however, it’s a definite big, fat tick right in the middle of the Adventure category box. 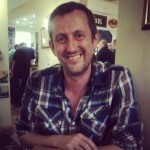 Good luck Richard – looking forward to seeing some shots of you wearing that Adventure T-Shirt you’re taking with you! Bon voyage.